The dimmable, 5,200-5,400K Ice Light LED is impressive on its own, but if you want to maximize its creative possibilities the Ice Pack Kit from Westcott is a savvy choice. The kit includes a two-way barndoor set, a tungsten conversion gel, two-way connector, a tilt-bracket with spigot, car charger, flexible tripod and a carrying case to store and transport it all. Use the barndoors to control and direct the light beam from a wide flood to a narrow slit. The gel will convert the light from daylight to tungsten balance for creative effects or to match indoor light sources. The two-way connector and heavy-duty tilt-bracket allow you to mount multiple Ice Lights together or tilt a single Ice Light on a light stand. The tabletop Flexible Tripod makes it easy to support the Ice Light in tight spaces and low angles for under lighting a subject for ambience and the car charger is a life saver for charging the Ice Light between shoots on the road. All of these accessories are protected, organized and safely stored in the provided custom Ice Pack Carry Case. 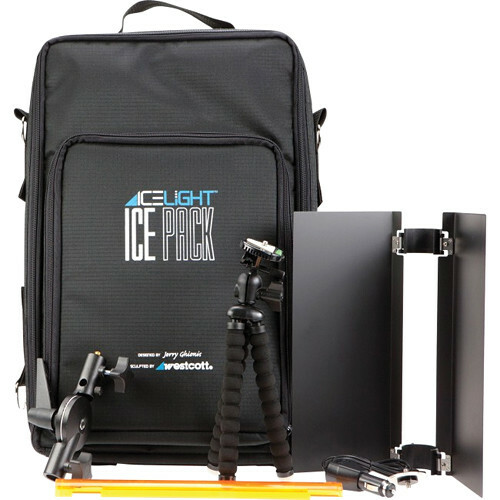 Box Dimensions (LxWxH) 22.0 x 14.7 x 7.0"
Ice Light Pack Kit is rated 3.5 out of 5 by 2. Rated 3 out of 5 by SnappyJo from Doesn't hold up to Ice Light I was a little disappointed in the accessory pack.. The bag's quality is average at best - I'd like to see something sturdier with a zippered pouch that contains a wrap-around waterproof cover. I've used it once (in good weather) and already a seam is ripping apart! The Ice Light is not to be used in adverse weather conditions however I may be carrying equipment from my vehicle to a location so it'd be nice to have some protectionThe barn doors seem to be acceptable and they look like they'll attach easily - I haven't used them yet so I can't recommend them but I think they'll be worth it! I like the gel that comes along although I wish you didn't have to use a clip to hold it on - it's hard plastic so it'd be nice if it just clipped on by it's own power.. I like the quality of all the other attachments, just overall disappointed with the bag. Rated 4 out of 5 by MDM Photo from Great Kit, small tripod is weak. Love every thing in this kit, but the Small Tripod.. I had the Ice light on it on the ground, and found the included tripod too weak to use on the ice light, with the barn doors.. I also think the carry case is a little to big for the gear in it, and the quality of the zippers is not the best.. Does it come with a regular charger (and how long does it last? ) and what is the output to use when traveling abroad, f.i. Europe? The ice light does come with a regular charger. You can plug it in or run it off battery. As far as travel abroad, just get a power converter and you plug it in just like you would in the US. I recommend getting a second battery. Each battery will last about 1-3 hours depending on what you are doing. I just throw the first one on charge while I use the second one. We love the Ice Light for certain applications. For it to be effective, you need to keep it about 4 feet or less from the subject for interviews. You are paying for convenience and light weight. I shoot a lot of car interiors so we hide it up under trunks, in back seats, etc. for general fill light. You can find lights for less, but the Ice Light is well thought out and very convenient. Is this pack compatible with the ice light 2? The short answer is yes. But don't take my word for it - theicelightcom/ice-light-2. Straight from the manufacturer's mouth. They do not let me attach a link here unfortunately.I have an ice light. I do not use the barndoors much, but the gel, the charger, the little tripod, and especially the tilter bracket with the spigot I use quite often. My biggest piece of advice is to get the spare battery. You can charge the first when it runs out of juice while continuing to work with the second. I have the original ice light which means you have to keep them fairly close to your subject. Icelights are of minimal use outside. I use them mainly to fill in shadows or back light on car shots.